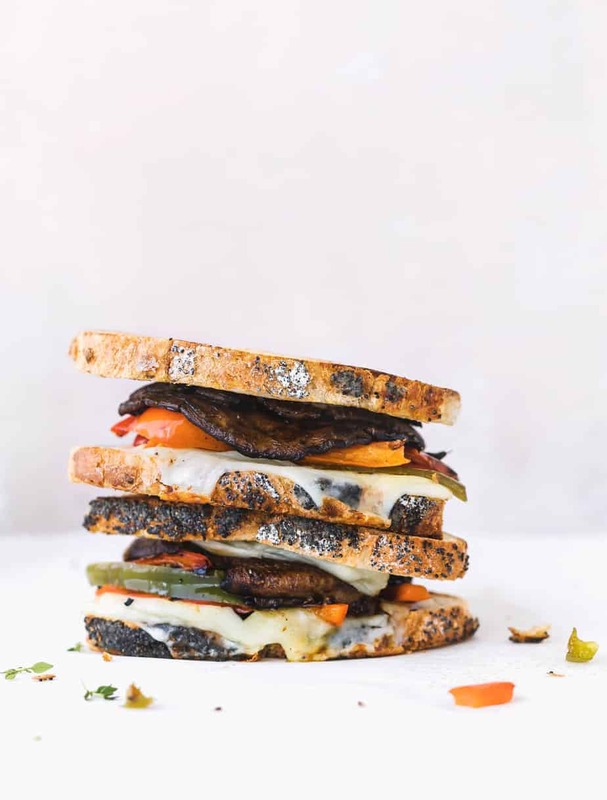 Marinated Portobello Mushroom Sandwich, served on a whole grain bread with grilled bell pepper, melted gruyere cheese, and mozzarella. To make this roasted portobello sandwich, I marinated the mushrooms in a balsamic vinegar oil mixture for at least 15 minutes then cook in the oven for about 10-15 minutes until they become tender. To prepare the portobello mushroom before cooking, simply remove the stems, scrape out the gills with a spoon if you prefer, and use a damp paper towel to wipe each side of mushroom to remove any dirt. You can repeat this step to make sure that the mushroom is fully cleaned. Do not soak the mushrooms because they can absorb all the liquid quickly and reduce the flavor. 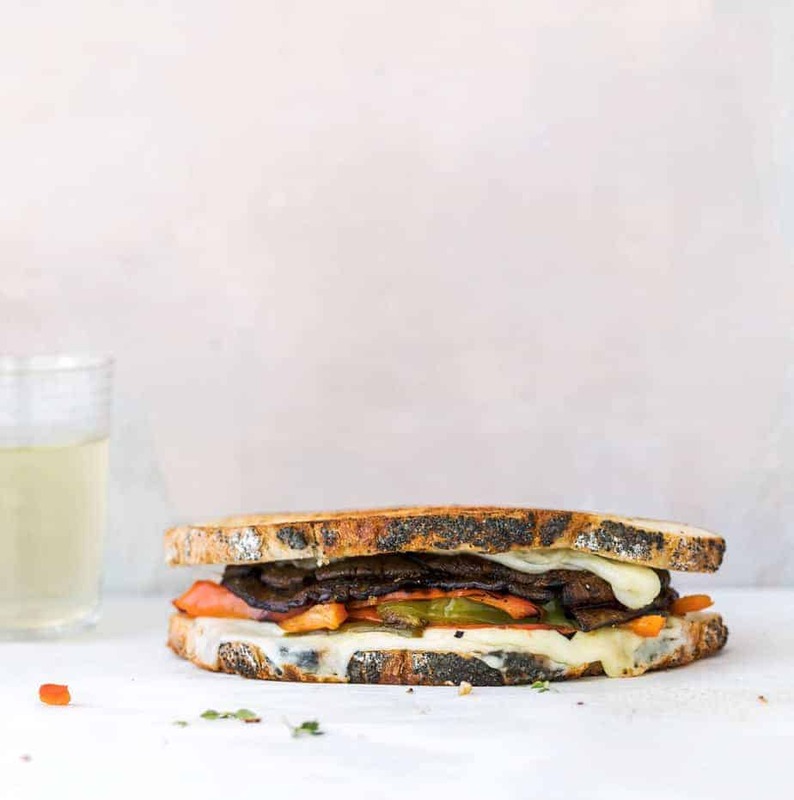 Marinated Portobello Mushroom Sandwich with Grilled Bell Pepper, Melted Gruyere cheese, and Mozzarella. In a large mixing bowl, combine olive oil, salt/pepper to taste, garlic, balsamic vinegar, onion powder and thyme leaves. Clean mushrooms and remove stems. Wipe them with a damp cloth. Marinate the mushroom in an olive oil mixture for at least 15 minutes. Place the mushrooms on a baking sheet. Roast for about 10-15 minutes or until tender. In a mixing bowl, mix together bell pepper, olive oil, balsamic, sea salt/black pepper, basil. Place the bell pepper on a grill over medium heat and cook for about 8-10 minutes or until crisp tender and until the skin is completely charred. Remove the bell pepper from the heat, when cooled, remove the charred skin. Cut into small pieces and remove seeds. Optional: add salt/pepper according to your liking. 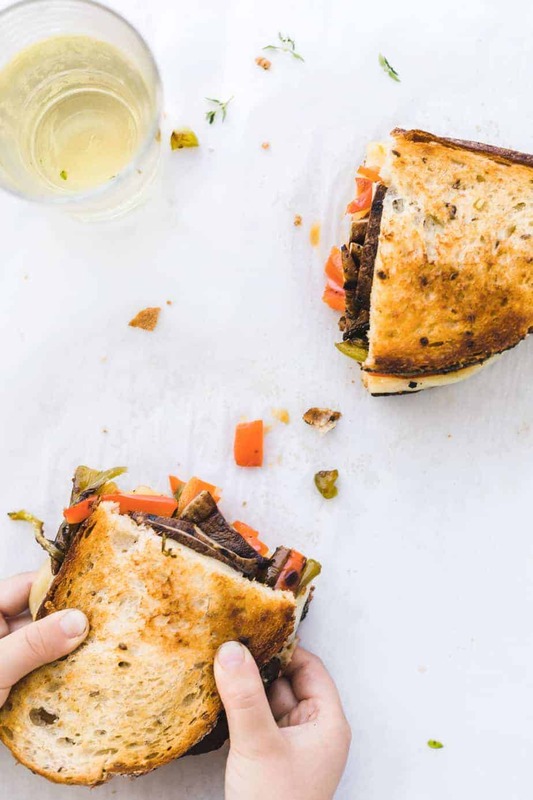 Assemble the sandwich with a slice of bread, a slice of Gruyere cheese, chopped portobello mushrooms, grilled bell pepper, a slice of Mozzarella cheese and another slice of bread. In a cast iron or non-stick skillet over medium low heat, heat 1 tablespoon salted butter. Place the sourdough sandwich in a skillet, press slightly until golden, flip carefully, add more butter if needed, cook the other side until golden and the cheese melts for about 3-4 minutes. I really want to have this sandwich now!!! So flavourful and delicious. I love vegetarian sandwiches like this! It would be delicious in a panini press! Yes! I want this sandwich. I could have some sort of sandwich for every meal if ‘they’d’ let me. 🙂 The flavors sound like a perfect combo. This looks like a great, vegetarian meal! I love the melty cheese and all the roasted/grilled veggies. I love roasted portobellos! This sounds delicious- I need to make more veggie sandwiches!